I felt the car sink up to its axles in the soft ground. Damn! The winds whipped heavy snow about my face. Large wet flakes settled and clung to my eyelashes, making it harder to assess my predicament, but the plummeting temperature meant I had to extract my little red Datsun before I rested or she’d be frozen in by morning. As my two little boys slept blissfully under a blanket on the back seat of the car, I stood alone in the storm feeling panic grow by the second. “I know you will,” I replied. But did I? Between chores, we filled blank spots in our time with concerts, movies, plays—anything that provided the maximum entertainment for the least amount of our precious money. We even managed one afternoon in Halifax with the Harlem Globetrotters. On that particular stormy night in late November, we had just returned from a puppet show, Aladdin, performed at the Bridgewater High School. The skies were overcast with a nip in the air when we’d left in the late afternoon. We emerged from the school into a raging storm—heavy, wet snow that accumulated fast. I struck out for home with my fingers crossed, hoping I could keep my car on the roads, most of which were narrow and rutted. Snow spiralled towards the windscreen as I fought the hypnosis it intended. Standard shift, front wheel drive and a homing instinct got us back to our empty farmhouse. I drove as close as I could to the house and woke the boys. But as they stirred from their blanket, the car settled into the earth. Or so I hoped. We had been gone for hours. The fires would be out and our poorly insulated house cold. My little boys ploughed their way to the front door as I made for the barn to collect boards and hay. The milk cow softly lowed a greeting which soothed the rough edges of my nerves. My “fancy” boots and nicer slacks were not designed to keep out the chill but I didn’t notice as I scraped away ice and dirt from behind the tires. The snow fell as fast as I could clear it. Such futility merely increased my frantic efforts. Before I dared face how I might push and drive the car at the same time, the front porch light went on. There was Pete, dressed sensibly in his overalls and big rubber boots, plodding through the drifts towards me. “Pete, you should be warm in your bed,” I said, relieved to see someone, anyone. The countryside was asleep, as we should have been. “I can’t leave you out here all alone, Mum,” he said. “Yep,” he answered. I gave him a quick lesson on how to use the clutch. It was close to midnight and we could barely see two feet in front of our faces. The snowflakes were smaller but thicker, indicating a drop in temperature and an intensifying storm. “Yep,” he said again and hopped in behind the wheel. “Reverse!” I screamed against the wind. My feet, searching for traction, found a rut that stopped them slipping. I pushed. She moved—not much, but she moved. I looked up to signal to my son. He had disappeared from view! On closer inspection, I found him stretched out under the steering wheel with his rubber boots firmly on the clutch and the brake, awaiting instructions. “We’ll try reverse again,” I called, unable to decide if I should laugh or cry. Backwards, forwards, backwards, forwards, while I pushed with all I had. Pete got it right every time and suddenly the struggling car popped out of the muck. I ran to jump in. Pete scooted over and I moved the Datsun onto more solid ground. We had done it! We had done it! I hugged my little man, for man he was. We put away the tools and headed for the house. Warmth welcomed us in. Somebody had lit the fires. I looked at Pete, who answered with a wry grin and wee shrug. What could I say? Stacked up together? I had my answer that stormy night. Understorey Magazine is a project of the Second Story Women’s Centre and a registered charity. If you like what you see here, please share with friends and consider making a donation. Thank you. Barbara Cullen was born in Britain at the close of WWII. She emigrated with her family to Canada at the age of seven. She received a degree in Zoology from McGill University in 1967 and, after living in a variety of places in the US and Canada, chose Nova Scotia as her home. Here she had two sons by her first husband and one by her second. Her fourth son was born in Texas. The family returned to Nova Scotia in 1990. Barbara has spent the last twenty-five years farming, painting and, finally, writing. She now resides near New Germany with her husband, a dog and Jake, the cat. Joanna Close studied textiles at the Nova Scotia College of Art and Design University in Halifax, Nova Scotia, completing her Bachelor of Fine Arts with a Major in Textiles in 2004. She continued to study and completed a Master of Arts degree in Textile and Fibre Art at the Winchester School of Art in the United Kingdom in 2006. 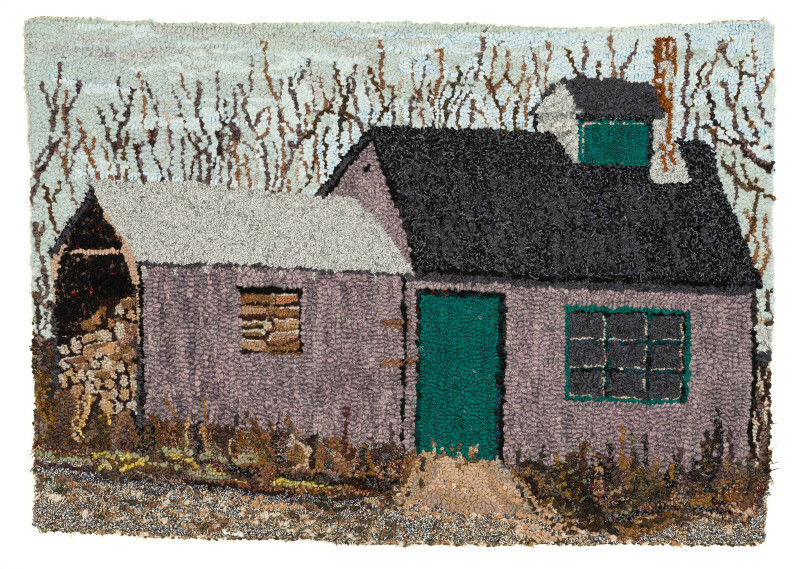 Since 2006, she has worked as a textile artist and illustrator in Nova Scotia, Yukon Territory and New Brunswick. Joanna is currently a regular part time instructor at NSCAD University in the Textiles Department. Joanna’s artwork explores the rural imagery of landscapes and plants using textiles and illustration. She currently lives and works in Nova Scotia. See more of Joanna's work on her website.